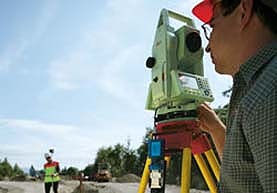 Topographic surveys are carried out using Leica electronic total stations to capture 3D observation data on site. This data is then processed in LSS surveying software to produce a Digital Terrain Model. The DTM allows contours, volumes and sections to be produced to the Client's specification. The survey output can be provided in various forms but in many cases the final information is provided in AutoCad format for design purposes. Prices for Topographic Surveys from £385 / day. The surveys are carried out on small sites using Leica Total Station Equipment and on large open areas using Leica GPS Equipment. They are carried out to either our own high specification or that as specified by our clients. The finished surveys are presented as either a hard copy or as a Cad file in one of the following formats: LSS - AutoCAD .DWG .DXF - MOSS GENIO. Brown field sites are being increasingly redeveloped after decades of industrial use. An accurate survey of a Brownfield site can save valuable time and money during the design stage. The finished surveys are presented as either a hard copy or as a Cad file in one of the following formats: Acrobat . PDF - LSS - AutoCAD .DWG .DXF - MOSS GENIO. Detailed highway surveys are invaluable to the highway engineer. All our surveys are collected in 3D with a high point density and can easily be imported into most design software. Essential for internal and external audit. Our stock surveys are accurate and cost effective providing managers with all the information they need for either annual quarterly or monthly auditing purposes. Update surveys can be used for planning and development purposes. They are essential for planning the long term development of any open cast pit. Tip surveys are are a requirement of The Mines and Quarries (Tips) Regulations 1971 which is part of the Occupational Health & Safety Policy. Our surveys can be used as part of any tip report. Essential for internal and external audit. Our landfill surveys are accurate and cost effective providing managers with all the information they need for either annual quarterly or monthly auditing purposes.